JSConf EU aims to be an inclusive and accessible conference. We understand that accessibility is a complex field and we realise that every person has their own unique needs. As a result, we do have some accessibility initiatives that help us to set a good baseline. For general services available at our conference, please see the about page. If you couldn’t buy an early bird ticket because your accessibility question couldn’t be resolved in time before they became unavailable, we’re happy to make sure you can still buy an early bird ticket. Please get in touch if this is relevant to you. Any assistant personnel accompanying you won’t need to purchase an additional conference ticket. We just need to know they’ll be attending, please let us know. In case you are invited to CSSconf and/or JSConf EU in any role (speaker, scholarship holder, MC, artist), you are asked, if you need a support person to attend the event either for support during travel and/or during the whole event. If needed and you can’t afford to cover the extra costs for a support person, we are happy to cover the costs for you and help with travel, accommodation and a ticket to the conference(s). Please let us know. A support person is necessary to protect the health and safety of the person with impairments/disabilities during the travel and/or events. What you can expect: our main event occurs at Arena Berlin in a 6500 square meter free standing hall plus a number of adjacent rooms and smaller halls. The main hall includes the main stage, the conference registration, a sprawling festival area with our conference attractions, community and sponsor booths, and a distributed food court for breakfast, lunch and dinner. See our photo gallery from 2018 for a set of impressions. The event space is equipped with clear signage pointing to everything you might require to find. During the conference opening and closing and during lunch at least all our ~1200–1400 attendees, speakers and personnel will be in the main hall at the same time. That is: it will be busy and noisy for at least these times. During the talks, the audio from the main stage will be audible in the background throughout the main hall. During the breaks, our Audio/Video artists will add ambient sound and lighting. In previous years this included loud and hard techno beats, but we are working with our artists to keep it more relaxed in 2019 and beyond. Outside light sources will be dimmed in the main hall during the day, but there are multiple outside areas for people to recharge on sunlight. To get an impression for what it could look, feel and sound like to be at the event, please see our 2018 mood video. We make sure that the main conference is well accessible to wheelchair users and people with reduced mobility, by both checking with the venue owner and by visiting them personally beforehand. The two areas we can’t offer effortless access to is our childcare services and our prayer room. We have support personnel standing by to help anyone to and from these facilities. For people who need frequent stops and rests, our main venue is equipped with various types of seating throughout. So while the event location is extensive, each individual trip can be short. 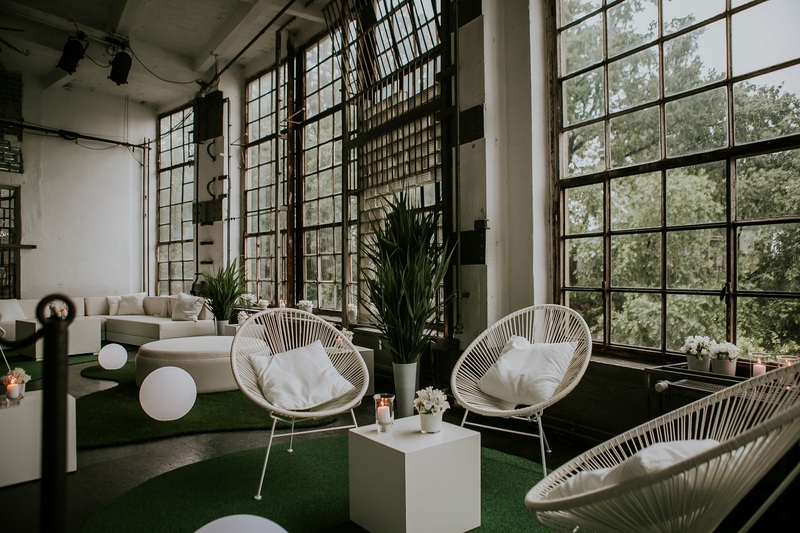 For people who need a break from the hustle and bustle of the event as described above, we offer a dedicated quiet area that fits about 20 people in total. This is, however, not a quiet chamber devoid of any sensory input, which is something we would like to offer, but isn’t possible given the constraints of our venue. Special rules for the quiet area will be posted in and near the location. For people with hearing impairments and for people who prefer reading subtitles, we provide real time presentation captioning for our two main stages. Additional locations inside the event might also receive real-time captioning, but we can only guarantee it for our main stages for the time being. Transcriptions will be available on separate monitors close to the stages with ample space for anyone to see them, as well as a text stream via dedicated URLs that we’ll publish here closer to the event, which can be used to stream the transcription to personal devices. Due to the variety of sign languages and unpredictability of actual needs, we do not offer any dedicated sign language interpretation at the moment, but we are open to discussing options with anyone who makes this a requirement for attendance. Please get in touch. Parents welcome, bring your 3yo+s! When buying a ticket, you can signify that you are interested in using our childcare services. If there are any things you want to sort out beforehand, please get in touch. Due to building limitations, our childcare facility is on the first floor and only accessible via a staircase. We have support personnel standing by to help anyone to and from childcare. If you are interested in our conferences and have any kind of accessibility question or suggestion (that isn’t sufficiently answered above), and that needs to be resolved before you can attend, please get in touch.